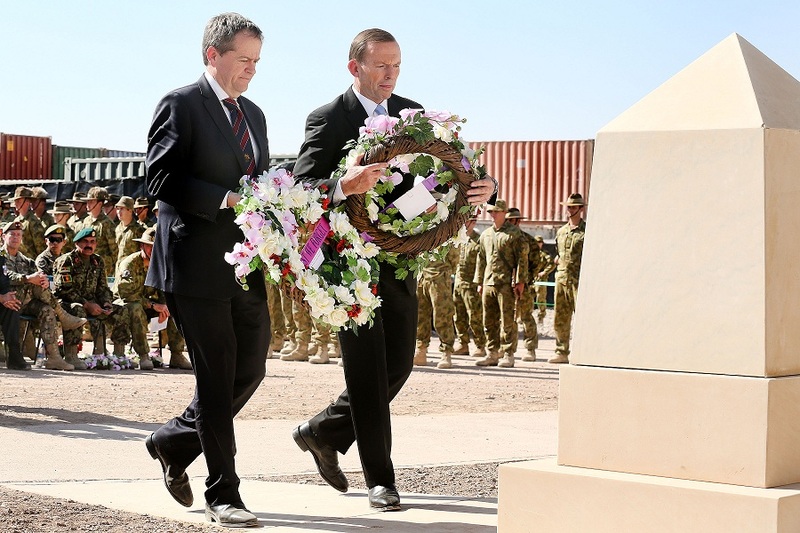 On Monday, seven weeks after Australia’s federal election, the new Prime Minister and the new Opposition leader stood together in Afghanistan  to declare the end to Australia’s longest war. The message from Tony Abbott and Bill Shorten was of a job nobly performed. There was no claim of victory after 12 years of military effort, and the mission-well-done language was marked by its hesitancy. Duty had been done, the troops were told, and at that point the rhetoric meter started to falter. PM Abbott captured both the tone and the balance with his opening words  at the ‘recognition ceremony’ at Tarin Kowt: ‘Australia’s longest war is ending, not with victory, not with defeat, but with, we hope, an Afghanistan that’s better for our presence here’. The contribution from Bill Shorten amounted to a heartfelt ‘me, too’, otherwise rendered as staunch bipartisan support. Not a victory but not a defeat, and we did our best, is the most provisional of epitaphs. It’s the ultimate balanced judgement of where we are after a dozen years, but as Australia heads to the military exit the final score is still far from being posted. One final achievement that can be measured, however, is the bipartisan unanimity that has marked Australian politics at every stage of the Afghanistan saga. I wouldn’t quite describe this long political consensus as remarkable, but at the very least the cross-party consensus has been notable for showing few cracks and never publicly wavering. Afghanistan joins the two World Wars and Korea as the conflicts that didn’t see Australia’s political parties at war over the war. Afghanistan, indeed, saw broad unity in Canberra on how the war should be fought as well as the agreement that it was a war worth fighting. This distinguishes Afghanistan from WWI, where the agreement on purpose was almost shaken to bits by the fight over conscription. The unusual joint visit by Abbott and Shorten expressed the political reality that Labor and the Coalition have both supported an Australian role in the Afghanistan conflict all the way through. They’ve both owned the war in government and neither has deviated when in opposition. During our longest war—as anything that looked like victory faded to invisibility—this bipartisan unity persisted; the consensus held even as the nature of the war changed and evolved, Australian casualties rose and popular Australian support fell away. Unlike any previous war, our leaders went to the funerals of the 40 Australians who died in Afghanistan, joined with families in mourning, yet assured them that the price was worth paying and the mission must continue. The leaders and their ministers had to go and see, each time, the human cost of what they’d ordered. The wrench involved in this repeated political duty shouldn’t be underestimated; we ask much of our politicians and these military funerals meant the human cost of Afghanistan called for much more than a signature on a letter of condolence. Afghanistan was supposed to be quick and relatively clean. Australian Special Forces went in with the invasion in October, 2001, and were out in 2002, as attention and resources turned to Iraq. In 2001, in the white-hot aftermath of the 9/11 attacks and the US proclamation of the ‘war on terror’, the Australian political consensus could be seen as the almost automatic response of one of the US’s staunchest allies. The enduring centrality of the alliance, of course, explains much—probably almost all you need to know—about the unbroken consensus of the Australian polity. Yet as Australia and its troops were drawn back to the Afghanistan war in 2005, this Liberal-Labor consensus never wavered, while the definition of eventual success had to be repeatedly redefined. Four Australian Prime Ministers have ‘owned’ the commitment to Afghanistan: John Howard and now Tony Abbott from the Coalition side, and Kevin Rudd and Julia Gillard for Labor. At the very least, this is a diverse group of politicians, but none ever faced much pressure from their parties to rethink the Afghanistan commitment. Howard, in Washington on the day of the September 11 attacks, never wavered from going along with the US. Rudd performed the difficult balancing act of withdrawing from Iraq while hanging on to the US alliance; a central element in this was the turn back to Afghanistan as the ‘good war’ that needed fresh commitment. Whatever elements of the Rudd legacy Gillard disowned, Afghanistan was a mission she embraced as strongly as either Howard or Rudd. Beyond the US alliance, what sustained this unanimity? How were Australia’s politicians able to continue to pursue the Afghanistan conflict when the great majority of Australians opposed the war for so long? One answer is that the Australian people supported the alliance while also being deeply doubtful about Afghanistan. And while the voters expressed their rejection of the Afghanistan war when talking to opinion pollsters, they didn’t translate that into action in the streets. If it was ever expressed at the ballot box, it was in 2007 when Howard lost office; but the anti-war vote then was much more about Iraq than Afghanistan. There was never any great wave of popular opposition to Afghanistan on the streets of Australia’s cities to compare to the anti-Vietnam marches. The grief at the return of the bodies of Australia’s fallen sons didn’t translate into any political action or activism; only the Greens stood against the Liberal-Labor consensus. The long bipartisan backing for Afghanistan rested on the alliance, but it drew strength from the professional nature of the Australian Army. Liberal and Labor leaders were sending volunteers, not conscripts. That three-way relationship between the people, a professional military and Australia’s politicians was an important element in the dynamic that allowed a series of governments to uphold the mission and keep calling for sacrifices. What that has meant for Australia’s military and what the leaving of Afghanistan will mean for the military in the future will be the subject of the next column. Graeme Dobell is the ASPI journalist fellow. Image courtesy of the Department of Defence .